Produced as a result of multiple requests for this color scheme. 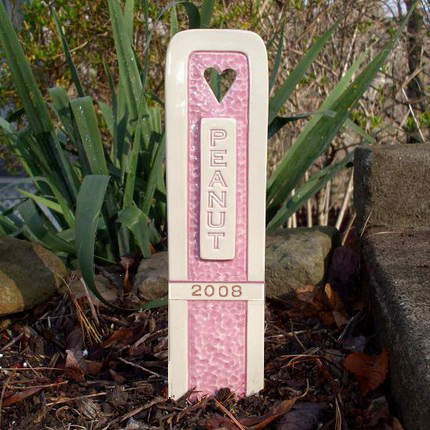 This affordable, yet distinctive ceramic marker is handmade of high-fired, white stoneware and will be a permanent tribute to your beloved pet. It cannot be damaged by outdoor elements or conditions. Featuring a black and clear glazed surface for endurance and easy cleaning, the marker measures 2 and 3/4 inch in width, is 3/8 inch thick, and will range from 13 inches to 14 inches in height, depending upon the number of letters in the name.